I finally got Netflix after debating with myself for quite sometime. I am stupid for not having signed up earlier. The price is great and the selection is WAAAAAYYYY better than any of the video stores in town (they have ballet – BALLET! – modern dance, opera – I’m in love). 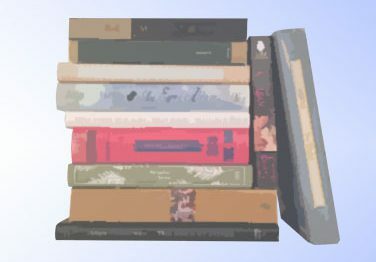 And now for a minor rant: If you are reading this, and you do any posting on a forum of any kind – for book groups (BNBC, SF, Yahoo), knitting, politics, AXS, whatever – please, for the love of God, use some punctuation and some capitals. Otherwise, I’m gonna rip your fingers off. How much of that do you think is fun to read? Imagine a whole page – several paragraphs at least – on a computer screen. At least throw some periods and capitalize the first letter of the sentence so I know when each one starts and ends. It’s like a foreign language! And don’t get me started on ALL THE PEOPLE WHO POST EVERYTHING IN CAPITAL LETTERS. Ugh. Current book-in-progress: Faulkner’s Absalom, Absalom; I’m starting Fitzgerald’s Tender is the Night since I think that’s what I want to write my paper on; and Bound to Please and The Cambridge Companion to Modern American Literature (oy – but good). Current knitted item: Eeyore #2 – and he’s on hold since I ran out of blue-gray yarn and had to order two skeins from Eydie (!!!! ); still have to seam and stuff both before April 1. Having just finished watching a movie at 12:30 am, I would normally go to bed. However, I’m a bit perplexed. I watched Onegin with Ralph Finnes, Liv Tyler, and Toby Stephens. According to the slipcase, the movie was rated “R” for brief violence and a sexual image. OK, big hairy deal. Finnes probably shows his bum again (who hasn’t seen it yet?) and, having read a bit of Pushkin before, you know that Lensky dies in the duel. Pretty graphic, right? Wrong. Lensky dies in the duel – head shot and you don’t see much except a blood pool. And the sexual image? Tatyana seduces her husband while wearing a nightdress – this is tame; all you see of her husband is his bare chest. They don’t even make it to second base before the camera cuts. Who rates this stuff? This is PG at most, except most kids wouldn’t make it five minutes before getting bored. Still, great movie. Speaking of Lensky, I stayed up until 4am last night to watch the Masterpiece Theatre adaptation of Jane Eyre – Toby Stephens plays Mr. Rochester and a wonderful job he did of it, too. I think he’s a bit young for the part, being not yet 40, but he was so gruff around the edges and his eyes are gorgeous. Ruth Wilson was a perfect Jane and through just her face and eyes able to convey so much of Jane’s thought process, a piece of the novel often lost in the transition from 1st person to 3rd person. I cried and cried when the wedding was thwarted by Mason and Jane ran away (I am rediculous). The writers also neatly inserted flashbacks (while Jane is at the Rivers’) where we see Rochester trying to convince Jane to run away with him; a much weaker woman would have caved. Beautiful adaptation. Current book-in-progress: Faulkner’s Absalom, Absalom; also peeked through the Johnston translation of the Pushkin and my three copies of Jane Eyre keep making eyes at me. Current knitted item: Eeyore #2; still have to seam and stuff both before April 1. Coming from B&N: The Prestige (Hugh Jackman and Christian Bale – double drool), The Illusionist (Edward Norton, Rufus Sewell, and Paul Giamatti – triple drool), Onegin (Ralph Finnes – drool again) and the PBS/BBC miniseries of Jane Eyre. So I watched Casino Royale as soon as I got it home. I love it – it’s such a faithful adaptation of the original novel which is nice after Moonraker, &etc., which resemble the original novels in title only. The only drawback is that while the stunts are amazing for the free-running chase sequence with Mollaka and the chase sequence at Miami Airport, both of them contribute to slowing down the movie and adding quite a bit to the length. But it is a Bond, and it’s fantastic. Love, love, love. Watched Minority Report (fastforwarded through a few parts – chuckled when Tom Cruise ate the moldy sandwich), switched it up with a viewing of Sense and Sensibility (old favorite – sort of like cleansing the palate at a wine tasting), and watched Marie Antoinette. It’s a good movie but very strange. I think about any sweet, young actress could have playing MA due to the script, direction and cinematography. What Sofia Coppola did so well was convey the isolation that MA felt – the actual spoken dialogue is very sparse and the action is carried through the visual image on the screen. The set and costume designs for the movie are fantastic and some of the supporting roles played by Judy Davis (the mistress of the household) and Rose Byrne (one of MA’s ladies-in-waiting) are wonderful. Current book-in-progress: The Autobiography of Alice B. Toklas by Gertrude Stein(for class). Truly, I can’t understand why I have to read this – it’s not very interesting. I would probably like it better if I were an art history major. The Faulkner is up next, but I really, really need to finish the Stein for Monday. Current knitted item: Eeyore #1=knitted (seams and stuffing not done), Eeyore #2=started. The nieces’ birthday party is April 1, so I really need to get the needles clacking.